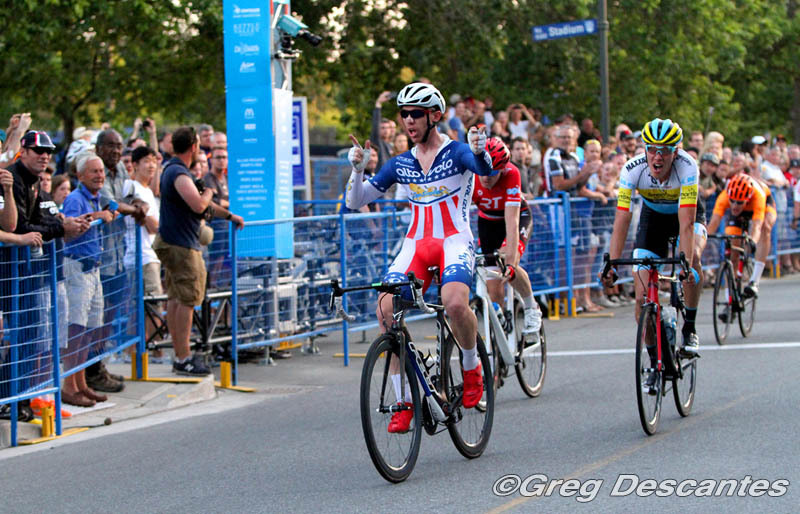 One year ago, Team UnitedHealthcare swept the podium at the UBC Grand Prix p/b Mahony & Sons. So with the UHC team returning this year, it's no surprise it had a major target on its back. Just three days ago at the Boise Twilight Criterium in Idaho, Daniel Holloway was able to hold off three members of UnitedHealthcare to get the win there, and he was able to do the same at the 30-lap, 48 kilometre fifth edition of the UBC Grand Prix on Tuesday night. "It's not just me, I've got AltoVelo-SeaSucker taking care of me all race and with equipment, and everything else. It's not just me who's participating in the adventure, it's my team that has set it up so I can be the face and today, it was super hard," the 28-year-old from Morgan Hill, California, explained. "I don't think anyone was able to get organized with six guys and I think today was just easier to have two of us - we could really move around, stay together, really save a lot of energy. The race was so hard, this is just a shock to the legs after travelling from Boise. I'm a little surprised, I just kind of wanted an opener for Gastown tomorrow, but I couldn't have had it any better." Coming second was Calgary's Kris Dahl of Team SmartStop, who won the 2014 U23 Canadian National Championships Individual Time Trial, while Sam Bassetti out of Santa Rosa, California, and riding with iRT Racing, finished third. Holloway and teammate Aldo Ino Illesic, who came in eighth, worked together perfectly to set up the win. "He just said 'patient, patient, patient' and we sagged, then climbed about every other lap to save legs and then he just had the perfect line all the way around the course. I just trusted him on that and he delivered me perfect. He came into the final corner so fast - scared me a little - I had a gap, Kris came underneath me and it ended up being pretty perfect because it forced him to do a really long sprint and I could take about six pedal strokes, relax and then accelerate just out of the roundabout," said Holloway. Dahl is the only member of Team SmartStop to start this year's UBC Grand Prix, and he was refreshingly honest about what he thought his chances were. "With UHC and AltoVelo and all those guys, and me being by myself, I wasn't too sure of my chances in the sprint. I figured I might as well hit out and see what I could make happen," said Dahl, who is a multiple Top-10 finisher at BC Superweek in the past and a fan of the new course at UBC. "The course is not bad, I'm more of a power rider, I'm a little heavier, so a climb is nice that's just not too big and this is about perfect." With a course that was markedly different from the previous four years of the UBC Grand Prix, it was an adjustment for those who didn't know what to expect. The course doesn't even really represent a typical criterium. "I like this kind of course, something that's hard, and something that rewards fitness," said Bassetti, a sixth place finisher in Saturday's Brenco Criterium. "So for me, this kind of sprint suits me and good, hard course where the pure sprinters maybe aren't quite as good normally. That's the type of course that I like." The race was forced to be restarted after a crash occurred just two laps in, which caused more than half the field to tumble less than 100 metres past the start/finish line. There were no serious injuries as a result of the crash. 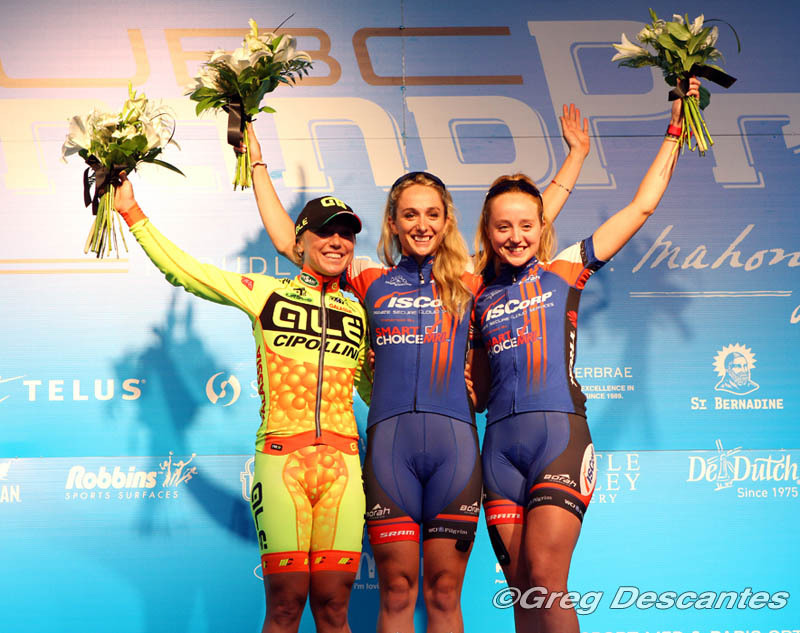 Sisters Samantha and Skylar Schneider train together, push each other, compete against each other, and work for each other on the ISCorp p/b Smart Choice MRI team - and both made an appearance on the podium at the 2015 UBC Grand Prix p/b Mahony & Sons. 24-year-old Samantha sprinted ahead of Ale-Cipollini's Shelley Olds, who posted a top-3 finish at BC Superweek for the fourth straight night. 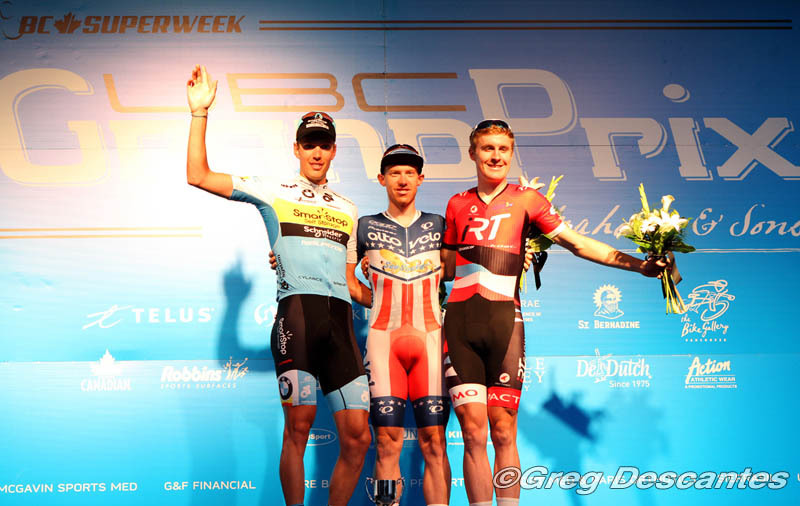 Olds, riding BC Superweek without any teammates, was third in Friday's MK Delta Lands Criterium, second in Saturday's Brenco Criterium, and won the White Spot | Delta Road Race on Sunday. 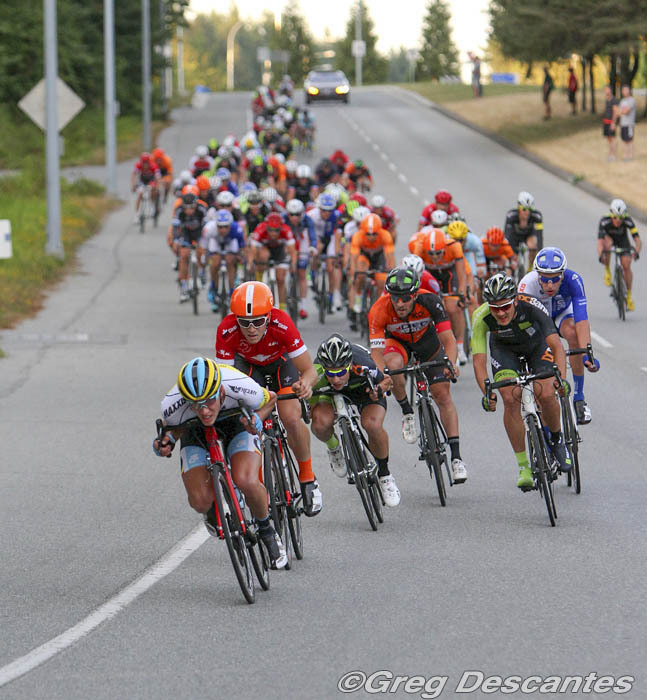 The race saw a number of riders breakaway, but the peloton brought them back each and every time - and the new course for the UBC Grand Prix played a big role in that happening. "After the climb, it's a bit of a headwind and a downhill, so it's a little harder in the break to ride, especially after the climb (at the start/finish line)," explained Olds. "Somebody attacks and then you have to close it, and then attack... it's not easy to ride after the top of the climb, so I think it wasn't ideal for the breakaway today." The elder Schneider wasn't exceptionally prominent during the 25-lap, 40 kilometre race, but made it count on the final sprint. "We just got in on Sunday, we came in from Boise, Idaho, and we did an US National Criterium Calendar crit there, so (we were) just testing out the legs today. We didn't know how it would feel in the sprint with this course... it was a really fun course," Schneider, who is an 11-time US National Champion, said. "I was here last year at UBC and it's a little bit different than last year, but very good crowd, very fun race and I'm really happy to be able to get the win today." 16-year-old Skylar, a 7-time US National Champion in her own right, took her sister's lead in the final lap. "It was a really hectic last lap, I was on my sister's wheel and she ended up winning. I had a lot of faith in her and followed her lines through the field. Once it came down to about 100 metres out, it was pretty clear who was going to get it," she said. On the final sprint to the finish line, the Schneider sisters, who finished 1-2 in the East Tosa Gran Prix series last month, were able to push Olds. "Shelley is a world-class sprinter, so I stayed behind her up until a couple hundred metres to go and was able to come around her," Samantha said. "Shelley's incredibly fast and deserves congrats on the second place finish." Much like she did in Saturday's Brenco Criterium in the Tour de Delta, Olds was dominant in claiming primes, maybe almost too much so as it looked like she left a little out on the road in the last lap and didn't have the reserves to push to be first to the finish line - but it didn't bother the 34-year-old from Gilroy, California. "I think I just get excited and go for everything. For me, this is all training and it's really good sprint training, every sprint is different in the primes, so I'm just training my mind and my body how to sprint right now... that's why I'm going for all the primes," said a smiling Olds after the race. 9 Jamie Gilgen (Can) Rise Racing p/b Cyclepath Woodbridge all s.t. 26 Mary Maroon (USA) ACADEMY all s.t. 40 Sabrina David (USA) Groove Subaru - Excel Sports all s.t. 43 Michele Schaeffer (USA) EV/DEVO pb Catalyst Kinetics s.t. 60 Catherine Fegan-Kim (GBr) DNA Cycling p/b K4 all s.t. 19 Travis Samuel (Can) H&R Block Pro Cycling Team all s.t. 21 Emile Abraham (Tri) Texas Roadhouse P/b Stradalli s.t. 34 Johnny Mitchell (USA) Team Finish Strong Elite Cycling all s.t. 37 Jack Burke (Can) Team NCCH p/b Dec Express s.t. 45 Coty Greenberg (USA) iRT Racing all s.t. 58 Dan Gardner (GBr) Astellas Cycling Team all s.t. 63 Chris Harland-Dunaway (USA) Herbalife p/b Marc Pro - Strava all s.t. 69 Alex Cataford (Can) Silber Pro Cycling all s.t. 71 Christoph Schweizer (Ger) Team Bike Aid s.t. 83 Nate Freed (USA) Herbalife p/b Marc Pro - Strava all s.t. 6 Rowan Morris (Can) TaG Cycling all s.t. 10 Christian Frandsen (Can) Fulgas all s.t. 13 Alan Zoller (Can) independent both s.t. 17 Eric Hung (Can) Steed Cycles both s.t. 19 Emil Marcetta (Can) EV/DEVO pb Catalyst Kinetics s.t. 25 Kendrick Wong (Can) Glotman Simpson Cycling all s.t.